What’s black, white, and red all over? My Christmas Day ensemble! I didn’t originally tag this dress as a “wear 3 ways” item, but this is my third post in it and I think each way I’ve worn it has been pretty different so I’m going to tag it after the fact 🙂 Check out the other two ways I’ve styled it in this post and this post. In light of the holidays and my recent milestone of hitting 1,000 Instagram followers (thank you! ), I’m doing a giveaway for some cute Gap winter accessories and a matching OPI nail polish. Check out my Instagram feed @ChristineInColor for the easy entry rules. Runs through the end of the year! I hope you all had a wonderful holiday! I had a very nice break from work (and from blogging). Posts will be a little slow while I’m still on vacation with family, but I’m looking forward to sharing new outfits with you in 2013! Posted in Outfits and tagged Everyday Sparkle, Holiday, ILY Couture, Kate Spade, Old Navy, Stella & Dot, Stripes, Wear 3 Ways, Zara. Bookmark the permalink. I did some serious wardrobe remixing! I made my dress into a top, and I’ve worn everything in today’s post in a prior post (except the ring): Dress, skirt, shoes, necklace and earrings, clutch. Posted in Outfits and tagged Baublebar, J. 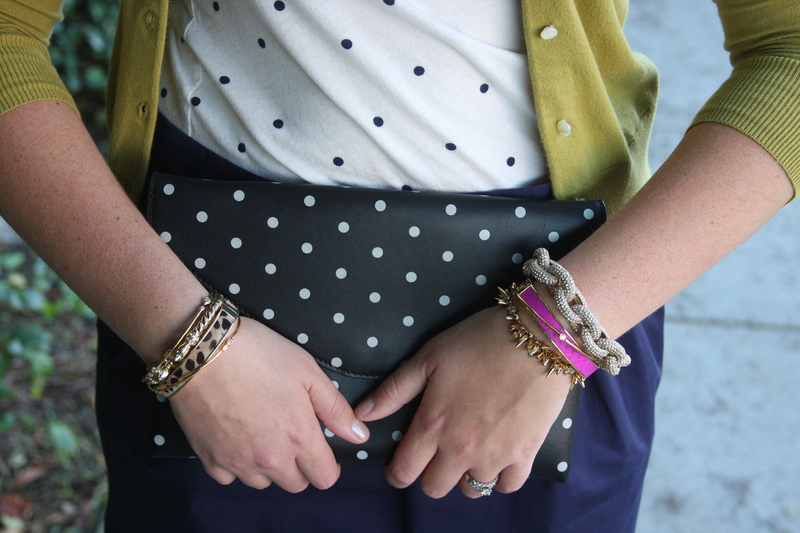 Crew, Old Navy, Pink, Polka Dots, Print Mixing, Rose Gold, ShoeMint, Stella & Dot, Stripes, Wear 3 Ways. Bookmark the permalink. 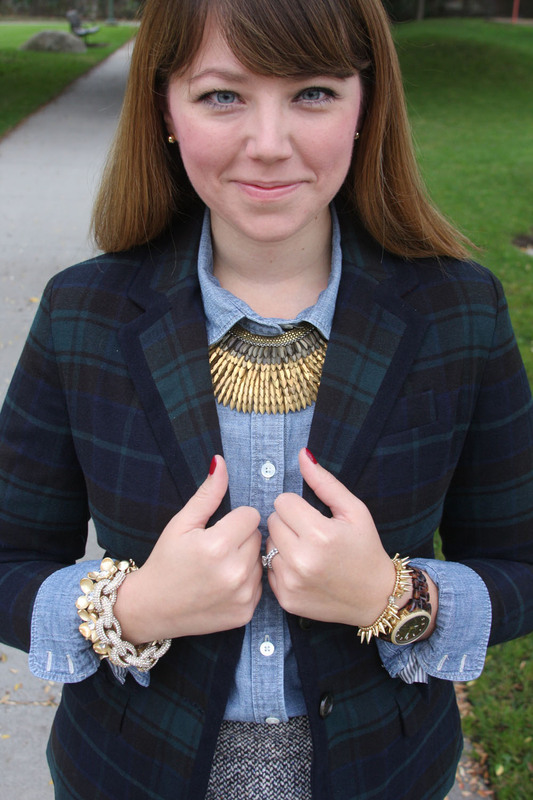 My wear 3 ways series is back with take 2 on this great tartan blazer I introduced in this post! 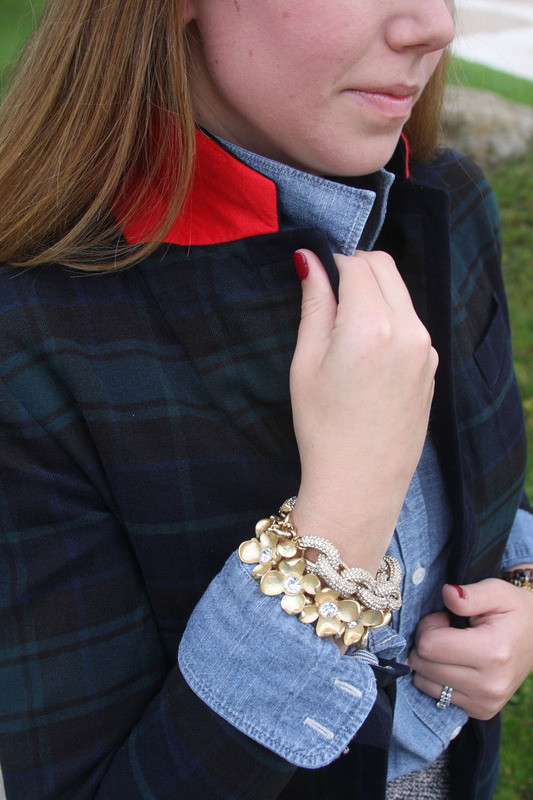 It’s hard to avoid tartan + red over the holidays, but there’s nothing wrong with a classic combo. The sparkly studded loafers spice things up! I added more pops of gold with a brooch and gold bracelets. I didn’t notice until writing this post that my J. Crew pave link bracelet made it into both outfits 😉 My husband keeps telling me I wear the same bracelets too many times. If that isn’t an invitation, I don’t know what is! How do you wear tartan? I’m always looking for inspiration for outfit number 3! 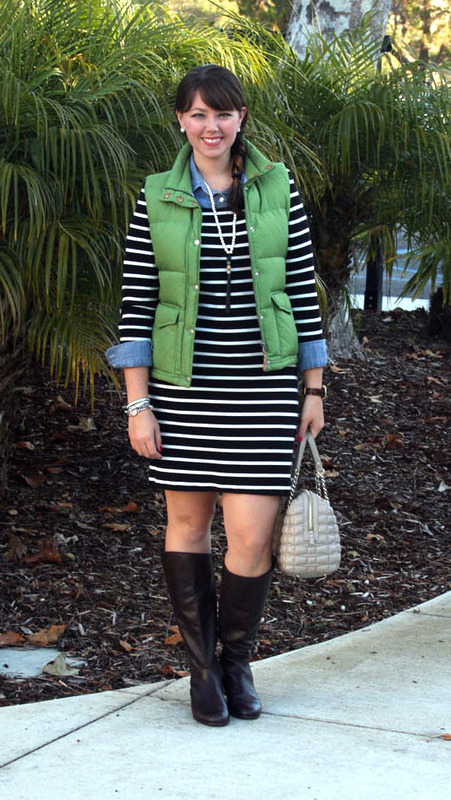 Posted in Outfits and tagged Banana Republic Factory, Holiday, J. 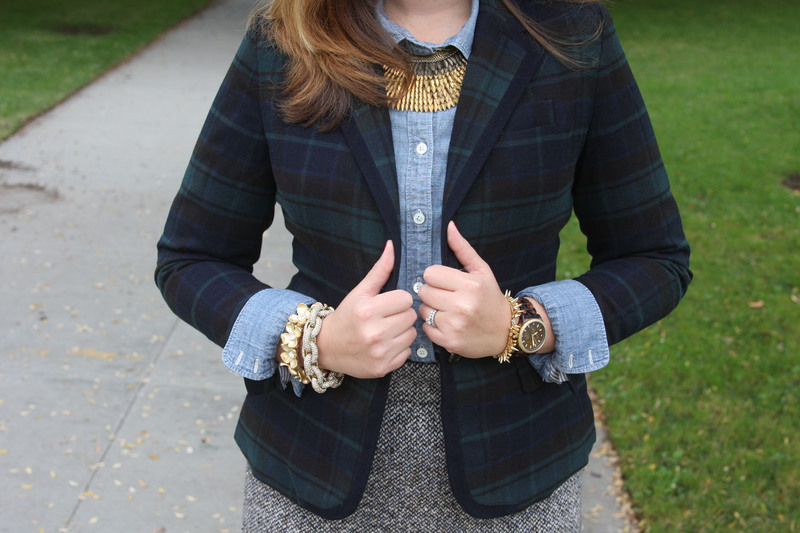 Crew, Nordstrom, Stella & Dot, Target, Tartan, Wear 3 Ways. Bookmark the permalink. Do you remember these fab pink heels I introduced in my first post? Now I’m showing you a second way to wear them! I opted for a silk blouse, cuffed jeans (so I don’t steal focus), and pops of pink and gold accessories. Blouse: J. Crew (other colors–on sale!) // Jeans: Paige Denim via Marshall’s. Similar here // Shoes: J. Crew (other colors). Similar here // Belt: J. Crew (old). 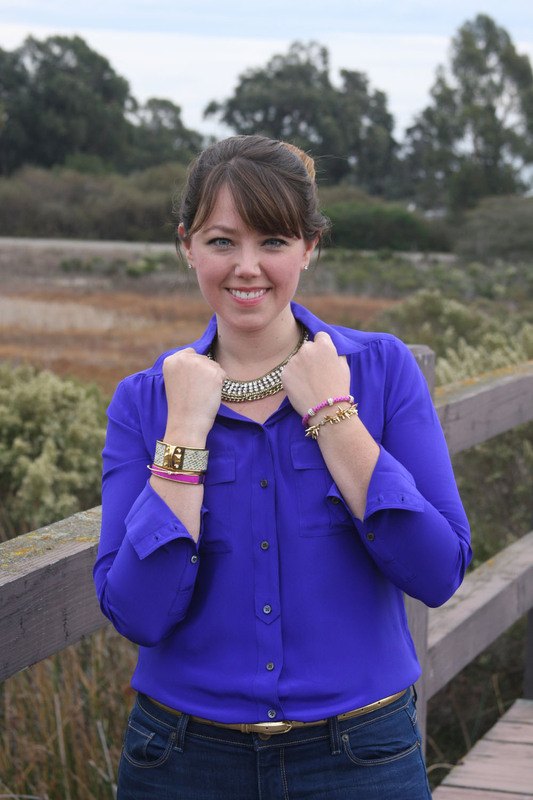 Similar here and here // Necklace: Baublebar // Bracelets: 1, 2, 3, 4 (on sale! ), 5 J. Crew (old). Not that similar but still cute! Posted in Outfits and tagged Everyday Sparkle, J. 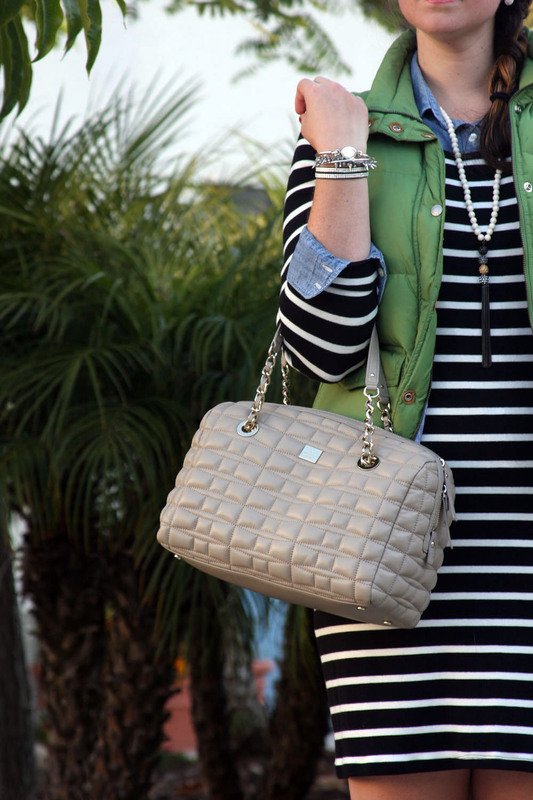 Crew, Marshall's, Paige Denim, Pink, Stella & Dot, Wear 3 Ways. Bookmark the permalink. Conveniently the weather has turned colder (wasn’t I just complaining it was 80?) so I could break out my Target tartan blazer. I love the detailing of the orange underside of the collar and the striped lining (which you can’t see because of my shirt). 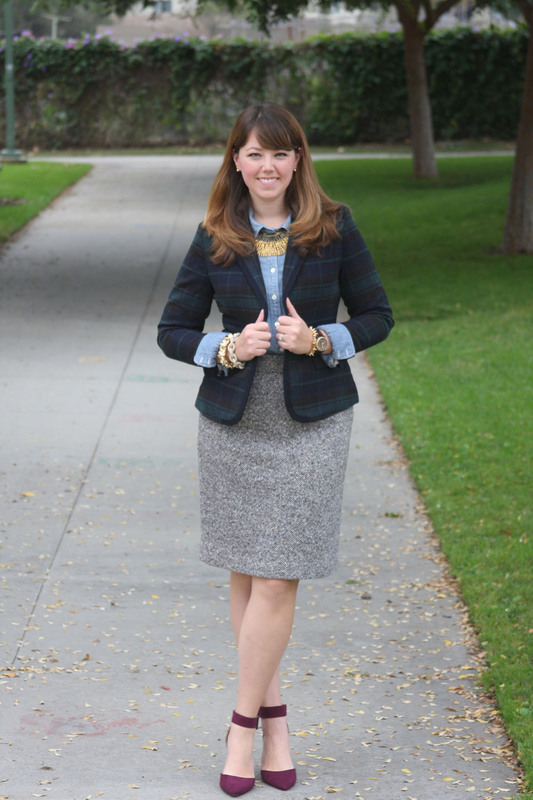 I’ll be bringing this blazer back for a “how to wear 3 ways” series in the future! I haven’t forgotten about my pink shoes from my first post. Those will be returning for their second installment shortly. Speaking of Target, stay tuned for my next post–great holidays finds from that wonderful store! Posted in Outfits and tagged Chambray, In Pink, J. Crew, J. 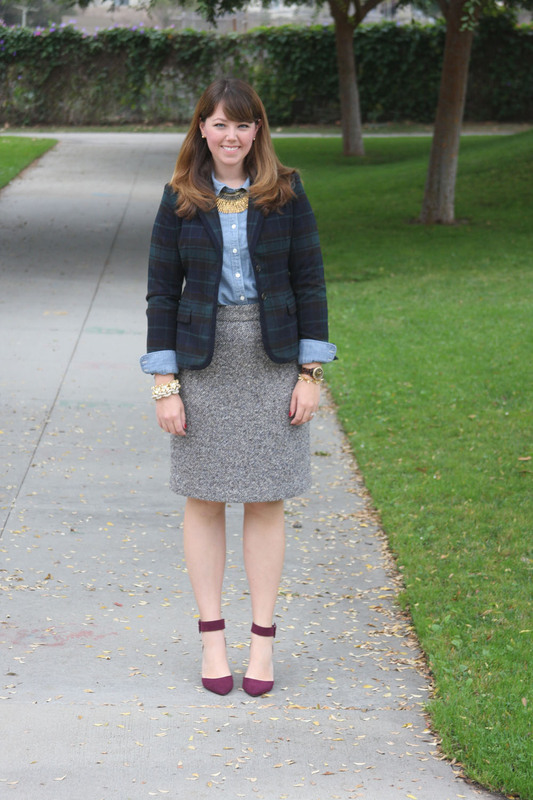 Crew Factory, Print Mixing, Stella & Dot, Target, Tartan, Tweed, Wear 3 Ways, Zara. Bookmark the permalink. Welcome to Christine In Color! 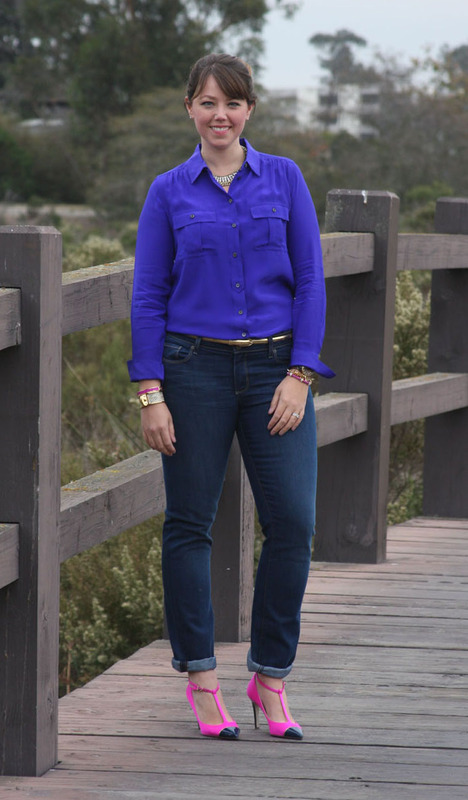 I’m Christine, and I love colorful, affordable fashion. I previously worked in the retail industry and one comment I frequently heard from customers was that they didn’t know how to wear color. I love mixing colors and patterns, and I am here to show you how to do it too! I’m sure I will expand the features of Christine In Color as time goes on and I would love your feedback on what you like or would want to read. I’m kicking off my “how to wear an item 3 ways” feature with my wonderful, pink heels. I fell in love with these as soon as I saw them. When I showed a friend, her response was, “yeah, those are beautiful… but what are you going to wear them with?” Hot pink heels are admittedly not every day shoes. And while it’s okay to have certain items that you don’t wear very often (i.e. wedding/party dresses or accessories), in general, you shouldn’t have something that you don’t know what to wear it with, or that you only have one outfit to wear it with. To combat this problem, when I buy something that I’m not sure how I’m going to style, I find 3 outfits I already own to wear the item with. If I can’t, I don’t get to keep the item. Look for outfit number 2 with these beauties in a few weeks! What’s your favorite color combination? How do you like to wear it? Posted in Outfits and tagged Banana Republic, J. 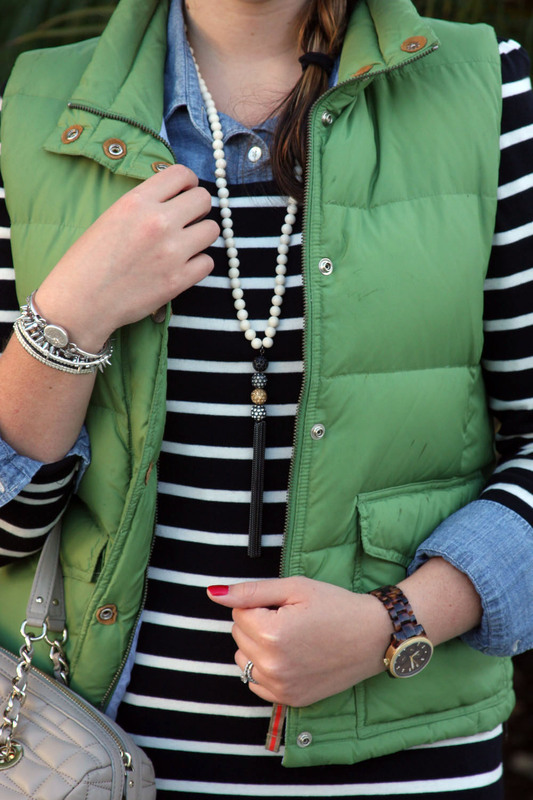 Crew, Navy, Old Navy, Pink, Polka Dots, Stella & Dot, Wear 3 Ways. Bookmark the permalink.